It is hunting season and what do bow hunters do to improve their archery skills? Well, they go fishing! Bowfishing or archery fishing as it sometimes called is the technique of hunting fish using a bow and arrow. Bowfishing is a favorite activity during the hunting season in the summers and it’s extremely addicting. Hunting carp and other fish on the river is a great outdoor activity and to hone the archery skills. Although the term “bowfishing” may seem new to some readers, but the concept of catching fish with a bow and arrow is as ancient as it gets. Humans have been hunting fish like this for centuries. Indians in the Amazon River Basins, for example, still use bowfishing to hunt fish as they did for many generations. Some of you may compare bowfishing with spearfishing. Sure, both techniques use a sharped, pointed object to hunt fish, but the major differences lie in the tools that are used. Bowfishing uses a bow to propel the arrow, whilst spearfishing depends on your hand for propelling the spear. If you’re spearfishing underwater, you will also require diving gears, such as snorkels or scuba. Bowfishing as a sport IS increasingly becoming popular among both hunters and fishermen. According to AMS Bowfishing, more and more bowfishing tournaments are being held in the United States and Canada annually. Furthermore, the activity of bowfishing is spreading outside of North America. forums dedicated to bowfishing has been popping all over the internet, and there are many outdoor guides offer bowfishing trips in many countries including the United States, Canada, Australia and New Zealand. First things first. It is important to check with your state’s fish and wildlife agency to confirm whether any license is required for bowfishing, so you don’t run into any legal issues. In addition, check your state’s fishing rules and regulations to find out where bowfishing might be restricted and which kind of fish you can shoot. Usually touring agencies outline bowfishing species on their websites and marketing materials. For beginners these are good resources to identify bowfishing hotspots. Now let’s talk about bowfishing hotspots. Maps are good resources to locate spots or habitat ideal for bowfishing, especially for beginners. Matt Schillinger, a public-relations specialist for AMS Bowfishing, also seems to agree. “Maps show you the layout of lakes, ponds and rivers,” Schillinger said. Maps also detail contours, weeds, vegetation and water depth. They also help users to pinpoint back bays, feeder creeks or drainage ditches. These places have slow water current making it ideal for most rough fish to dwell. Carps and other fishes also prefer habitat that has sufficient food including insects, minnows and aquatic vegetation. Rock beds, downed trees, and weed beds are also good bowfishing spots. When you arrive at a bowfishing spot, inspect the area for signs of fish. If the spot has fish you may hear and see water splashing, V-shaped patterns, spot ripples, or muck bombs on the water. Muck bombs are unleashed by active fish when taking off and disturbing the bottom of the water body with their tails. Shallow water surfaces with good visibility indicate a good place to bowfish. After all, if the water is murky, you can’t see the fish. And if the fish isn’t visible, you can’t shoot the fish. Places with shallow water that offer good visibility include shallow flats, weed beds, marshy areas backs of coves, and so on. 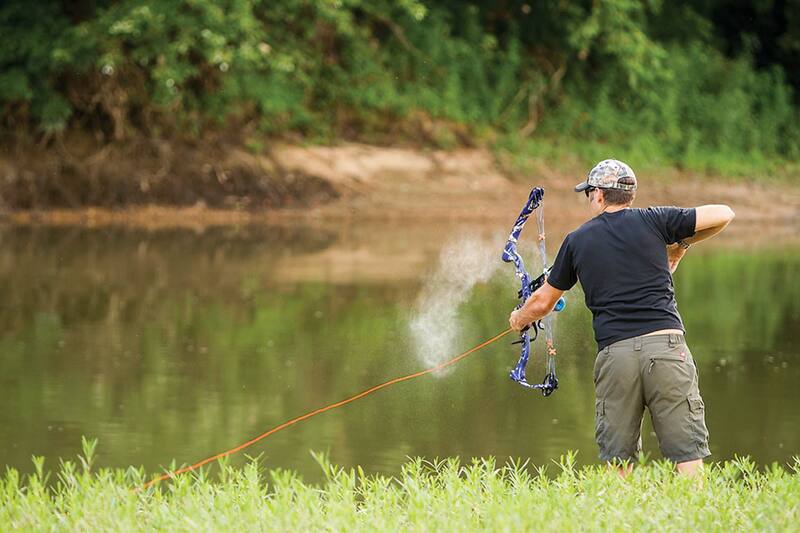 During summers, one of the best spots for bowfishing can be below dams and spillways. Areas, where streams and creeks feed into big rivers and lakes, are also good bowfishing spots. However, check with local authorities and site regulations to ensure that bowfishing is legal in those areas. For amateur bowfishers, bowfishing in carp spawns can be one of the best places to improve their skills. Depending on location carp spawn takes place from late March through early July. During carp spawning periods, the fish move into shallow water and grass beds. They number by the hundreds and stack up side by side which makes almost half of their bodies exposed out of the water. Similarly, gar spawn occurs later into the summer months. You can find gar spawns along shallow coves, rock beds, riprap, sloughs, and creeks. In similar fashion, the gars swim together in herds or lie on the surface. This makes it easier for bowfishers to nab more than one fish on an arrow with a single well placed shot. Bowfishing forums, bowfishingzone.com or bowfishingcountry.com, for example, are excellent resources to locate good bowfishing spots. Both forums have plenty of useful information, which can be immensely helpful for people new to bowfishing. You can also participate in local bowfishing clubs or associations. Bowfishing Association of America is a great place to start. You can also join local bowfishing clubs in your area. At last but not least, talk with bowfishing retailers like at Backwater Outdoors. These folks are considered to be among the largest bowfishing equipment retailers in the country. Backwater Outdoors is a bowfishing aficionado and they love sharing their knowledge and experiences of the sport with beginners. 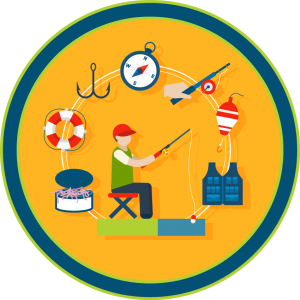 You can also ask other sport fish anglers to give you directions about swarms of rough or invasive fish. They’ll love to help and to make sport fishing a better activity.